There is something about swimming in the sea that just cannot be surpassed. The sense of freedom that comes from knowing that, if you wanted to, you could just keep going. The relaxing buoyancy of the salty water, supporting you as you recline and look up at the sky. The little rushes of excitement that come from the ebb and flow of the waves, reminding you that you are at the mercy of nature’s power. There’s the refreshing coldness too. It might take your breath away at first, but once the tingling in your limbs have stopped and your body has become acclimatised to its new environment you cannot help but submerge your head beneath the waves to be enveloped by that invigorating chill once again. I think that last part might be a side effect of living by the sea. I’ve never been super keen on British waters, preferring the more gentle touch of the water in warmer climes. This summer though, when we were in Barcelona, I found that there was something missing when I clambered down the beach and dived in. It was just not cold enough to give me what I was looking for. It was the prospect of seeing the sea every day, of being able to go for a dip whenever the mood took me, that was one of the biggest lures for life in Brixham. When I lived in London I found myself craving it – an ache in my heart that could not be satisfied by even the most impressive lido. I want to be one of those people who dives beneath the waves every day, whatever the weather. I’m not there quite yet, but it gives me a deep satisfaction to know that the sea is part of my daily life. I’m watching it out of the window now: a turquoise blue rising up to meet the sky at the horizon, white horses breaking gently as the breeze ruffles its surface. It looks so inviting I don’t think I’m going to be able to resist for much longer. In fact when Arthur wakes up from his nap we might just have to go for a swim. Joining in with The Alphabet Photography Project over at PODcast Dove. 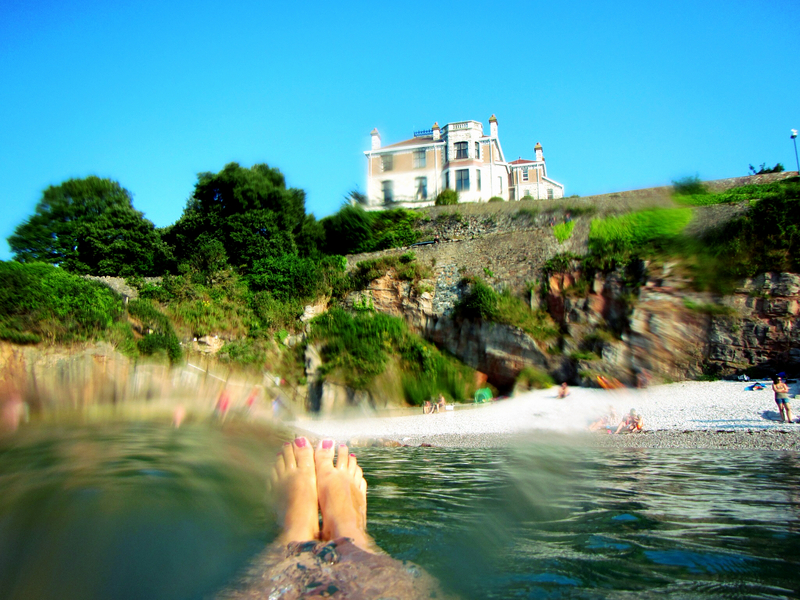 This entry was posted in Sophie is photographing, Sophie loves Brixham, Sophie loves Devon, Uncategorized and tagged brixham, sea swimming on September 17, 2014 by sophieblovett. That’s a lovely photo! I love the sea too, but the water is always too cold for me 😦 #alphabetphoto.